I was having dinner with my co-workers the other day when one of them mentioned that it would be fun to have a guacamole taste test between a homemade recipe, a pre-made/pre-packaged version from the grocery store (Mad Mexican) and a commercial/restaurant version from Chipotle. My coworkers love guacamole so it didn’t take a lot of convincing. They all agreed that it would be a lot of fun to have a guac off. Two of my coworkers volunteered to make the homemade ones based on tried and true recipes that they use. Another two of my coworkers brought in the store bought varieties – Mad Mexican and Chipotle. Which guacamole will come out on top? This is going to be interesting. Part of me thinks that homemade guacamole *should* taste better because of the freshness of the ingredients compared to the pre-packaged one from the grocery store. But this could vary based on the recipe and quality of the ingredients used. I think that both homemade varieties will rank better than the grocery store guacamole but I think that the restaurant/take out guacamole will come out as the overall winner. If the restaurant is any good, they will also be using fresh ingredients plus they have the added advantage of having a recipe that has been proven to be reliable, tried, tested and deemed profitable since they are making batches of it and selling it everyday. Please sample each of the guacamoles and comment on appearance, texture, taste. Which one do you like the most and why? 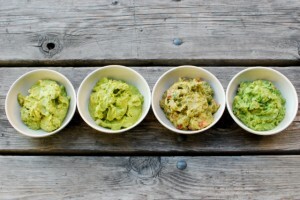 All four of the guacamoles were similar in appearance but they all had very different taste profiles. Homemade A was simple and the taste of the avocado really shone through. Mad Mexican had a noticeable taste of chillies and spiciness which some people thought was overpowering and distracting to the overall flavour of the avocado. Homemade B had the addition of several ingredients including tomato, hot sauce and cumin. Some taste testers found the flavours to be a little too complicated. However, this guacamole was also prepared the day before which resulted in the consistency being more watered down and the flavours not as pronounced. (Hint: When serving guacamole, make it about 3 hours before serving as this will allow the flavours to combine but serve it the same day as the ingredients will still taste very fresh). Chipotle won from an appearance standpoint as the guacamole was the brightest green out of all four and had a lumpy texture. People generally prefer homemade A and Chipotle. Homemade A had flavours that were clean and the taste of avocado really came out. Chipotle’s guacamole was also popular as the flavour was also fresh and clean but there was also an earthy/grassy flavour to it that people found refreshing. Homemade B and Mad Mexican had the addition of spices which taste testers found to be distracting or overpowering to the taste of the guacamole. Both homemade A and Chipotle’s guacamole were the favourites from this taste test. As a general rule, stick to simple flavours with guacamole and showcase the freshness of the ingredients. Both homemade and take out (from Chipotle) are the way to go when it comes to guacamole and are similar in cost. Who would have thought? I personally think that Chipotle should consider widespread distribution of their guacamole based on the results of this taste test. I would definitely buy it. Overall, it will still be slightly cheaper to make guacamole from scratch but if you want an appropriate portion size and aren’t stuck with a bowl of guacamole to finish, head over to your nearest Chipotle. A – Pretty similar to B in appearance. Do I taste garlic powder? And a hint of salt? This smooth guac tastes homemade and not too salty. The way it should be made if it’s being consumed often. B – Pretty similar to A for appearance, but a little brighter green which is nice. Smooooth – with a limey kick at the end! A little saltier than A. The extra smooth texture makes me think it’s been machine blended rather than by hand. C – The brown colour makes me think this is homemade d/t browning, which is ok, but probably wouldn’t have mass appeal as far as appearance. This guac has a bit of a spicy finish, but not as limey and little salt. D – I like this appearance the most – bright and with some pieces to make it authentic. Delicioius! Definitely saltier than the others but a nice balance of flavours … actually it could use a touch more lime as that is my personal preference. Pieces of avocado add authenticity. A – Chopped onions, a bit chunky. I’m not a fan of raw onions so this can’t be my favourite, but it was good. B – Lemony, very smooth. I like this one but if I was able to change anything, I’d tone down the lemon a bit. Is this Mad Mexican? D – Most avocado flavour. Smooth but textured. I see avocado, red onions, green herb of some sort. My fav. Is this Chipotle?! I have good memories of Chipotle! A: a little dull in colour and bland, yet bitter flavour. Texture was denser and not as smooth as others. Probably my least favourite. B: Nice green colour and good smooth texture but onion dominates the flavour, which I didn’t like. C: There’s some enzymatic browning going giving this quac and unappealing colour. Too much cayenne, which dominates the flavour and makes it too spicy for my preference. This one looks and tastes homemade to me. I like the tomatoe but not sure it’s a traditional ingredient. Not my favourite. D: This is my favourite quac. It has a fresh, bright flavour and colour and good balance between spicey and salty and “limey”. Thanks Lisa. This was a great taste test…I could eat all 4 bowls myself. This is hard because I love guacamole in general! A: Homemade. Onions still crisp – yum! Good green colour. Excluding C because it was a bust and very different from the other 3, A is my favourite! B: Store bought. Tastes like avocados and lemon. Something is missing. Like the least. Good green colour. C: Homemade. Not as appealing colour-wise but it’s because the cumin changes the colour. And it was made the night before vs day of. Has tomatoes and overnight they made the guac a bit liquidy. Could have put a little less sour cream even though already put less in than usual. It’s got a bit more kick than I usually do (Note: don’t listen to the husband when he says to add more!) Tasted better last night. Overall I’m not impressed with my own guac, it usually tastes better. D: Taste a lot of lime (one of them tasted like there was a lot of lime, I think it was this one?). Good green colour. Overall, guacamole is fairly inexpensive to make and doesn’t take that much time so I would make it over buy it. I’ve never found one in the store that I love. I liked A and D the best. I liked A because you can really taste the avocado and I like D for it’s texture, colour and taste. A: Tastes fresh and bright. Can taste the flavour of the onion and lemon juice. Tastes likes good, classic guacamole. B: Has an overpowering chili taste to it which overpowers the flavour. I don’t like this one at all. Tastes medicinal versus fresh. C: Strange brown color. Looks like it’s been sitting out and has been oxidized. I can see chunks of tomato. Nice flavours but needs salt and some acidity to bring out some brightness in the flavour. Lemon/lime would have been a nice addition but in general I find the flavour combination in this one a little too complicated. D: Best color out of all four. Bright green. Love the chunkiness of the texture. Tastes earthy and fresh. I like this one as well. This one wins from a visual standpoint in terms of the bight green color and the chunky texture. A and D are my favourite, I like them both but for different reasons (A because of the simple and classic flavours, D because it has a nice freshness/earthiness to it).